Summary: In 1805, the United States was not twenty years old, an unformed infant. The government consisted of a few hundred people. The immense frontier swallowed up a tiny army of 3,300 soldiers. Following the Louisiana Purchase, no one even knew where the nation’s western border lay. Secessionist sentiment flared in New England and beyond the Appalachians. Burr had challenged Jefferson, his own running mate, in the presidential election of 1800. Indicted for murder in the dueling death of Alexander Hamilton in 1804, he dreamt huge dreams. He imagined an insurrection in New Orleans, a private invasion of Spanish Mexico and Florida, and a great empire rising on the Gulf of Mexico, which would swell when America’s western lands seceded from the Union. For two years, Burr pursued this audacious dream, enlisting support from the General-in-Chief of the Army, a paid agent of the Spanish king, and from other western leaders, including Andrew Jackson. When the army chief double-crossed Burr, Jefferson finally roused himself and ordered Burr prosecuted for treason. The trial featured the nation’s finest lawyers before the greatest judge in our history, Chief Justice John Marshall, Jefferson’s distant cousin and determined adversary. It became a contest over the nation’s identity: Should individual rights be sacrificed to punish a political apostate who challenged the nation’s very existence? In a revealing reversal of political philosophies, Jefferson championed government power over individual rights, while Marshall shielded the nation’s most notorious defendant. By concealing evidence, appealing to the rule of law, and exploiting the weaknesses of the government’s case, Burr won his freedom. Afterwards Burr left for Europe to pursue an equally outrageous scheme to liberate Spain’s American colonies, but finding no European sponsor, he returned to America and lived to an unrepentant old age. When one thinks of Aaron Burr the first thing that comes to mind is that he killed Alexander Hamilton in a dual. However, other information about Burr is not so well known. David O. Stewart takes care of that void in AMERICAN EMPEROR. Stewart gives us a detailed account of this Founding Father from 1800 to 1812. He begins with Burr as the clear number 2 on the Republican Party presidential ticket with Thomas Jefferson in 1800. Due to a quirk in the Electoral College system, Burr received an equal number of votes as Jefferson. Rather than accept the vice-president role Burr actually challenged Jefferson for the presidency. This challenge not only caused a rift in the relationship with Jefferson but gives the reader a sense of the character that would later strive to create his own country. The duel with Hamilton occurred in 1804 while Burr was serving as the Vice-President. It’s astounding to me that Burr continued to perform his duties as the Vice-President while wanted for murder in New York and New Jersey. By 1805, no longer welcome in the Republican Party as a viable candidate and thirsting for power, Burr embarked on a two-year plan to create his own country by taking advantage of the fact that the settlers of the western territories of the United States felt neglected by the federal government, the residents of the territories acquired by the Louisiana Purchase were not excited about being part of the United States and a weak Spain left them vulnerable to attack in the Florida and Mexican territories. Burr’s plan was ultimately discovered by the United States and he was tried for treason. Two interesting characters in this episode were General James Wilkerson and Chief Justice John Marshall. Wilkerson, serving jointly as a U.S. general and a spy for Spain, at first joined Burr’s quest and later played a role in bringing Burr to justice. Chief Justice Marshall, a distant cousin of Jefferson and one of the great Supreme Court justices, presided over the trial that cleared Burr of all charges related to treason. I found it intriguing that Andrew Jackson almost joined Burr’s cause. An interesting aspect of the book is the author’s characterization of Thomas Jefferson’s handling of the Aaron Burr situation. As amazing as it might seem, Burr did not quit there but spent several years in England and France attempting to obtain support for his plan to take over Florida and Mexican territories with him, of course, as the head of state. He had no success in this effort. Years later when the United States acquired these territories, Burr explained he was just ahead of his time. AMERICAN EMPEROR is a well researched and very readable account of this portion of Aaron Burr’s life. Stewart gives the reader great insight into his relationship with his daughter, his private life, his skills as a lawyer and his persuasive ability as a leader. I would recommend this book to anyone with an interest in American history. Thanks to the publisher for providing a review copy and to Booking Pap Pap for his insightful review. Thanks Booking Pap Pap. Now I know why he was asking me trivia questions about Aaron Burr! Thanks for this great review, Booking Pap Pap! I love biography and I like that time period in American history. 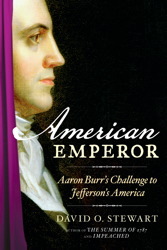 I know very little about Burr, so it looks like American Emperor would be great for me. I like that the author goes into Burr's private life as well as his political. I love books about Aaron Burr, and as you say, stories about Burr really through Jefferson into relief as well. Great review as always, BPP! It sounds like Aaron Burr would fit right in with today's politicians. That man must have had quite an ego. Thanks, Booking Pap Pap. What a terrific review. I think my husband would enjoy this book! This looks like a well-rounded biography, exploring the many side of Aaron Burr. Thanks for the recommendation.